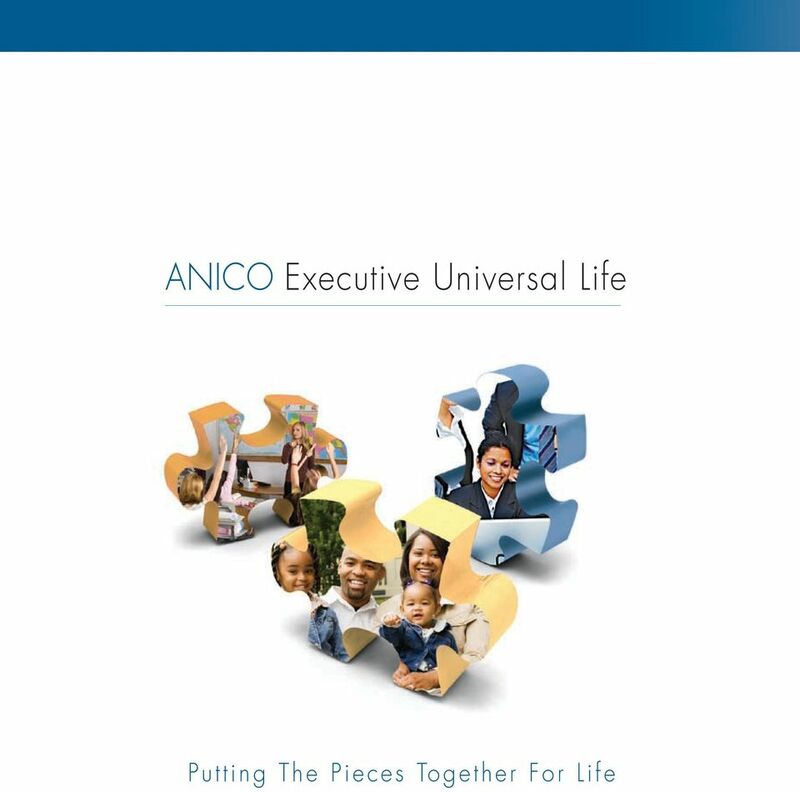 Download "ANICO Executive Universal Life"
3 Life s Puzzle Planning for future financial goals can be like putting together pieces of a puzzle. We usually don t have just one financial goal. We may begin with providing financial protection for the mortgage on our first home. 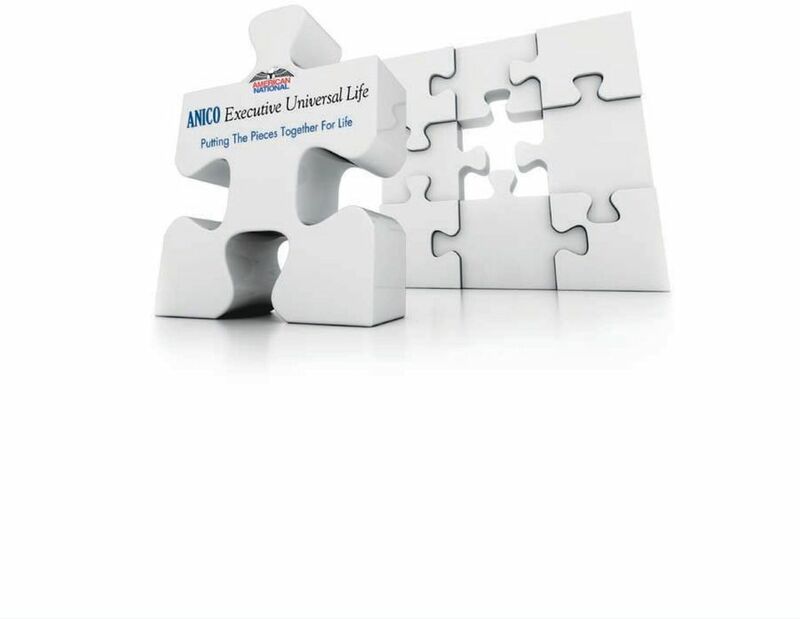 If we start a family, we add another piece to the puzzle when we try to anticipate future educational costs. Or, perhaps we open a small business and plan for growth through additional partners with the desire to protect against their loss. Over time, we may add and subtract pieces to our life s puzzle, and our financial goals will evolve and change to fit that puzzle. 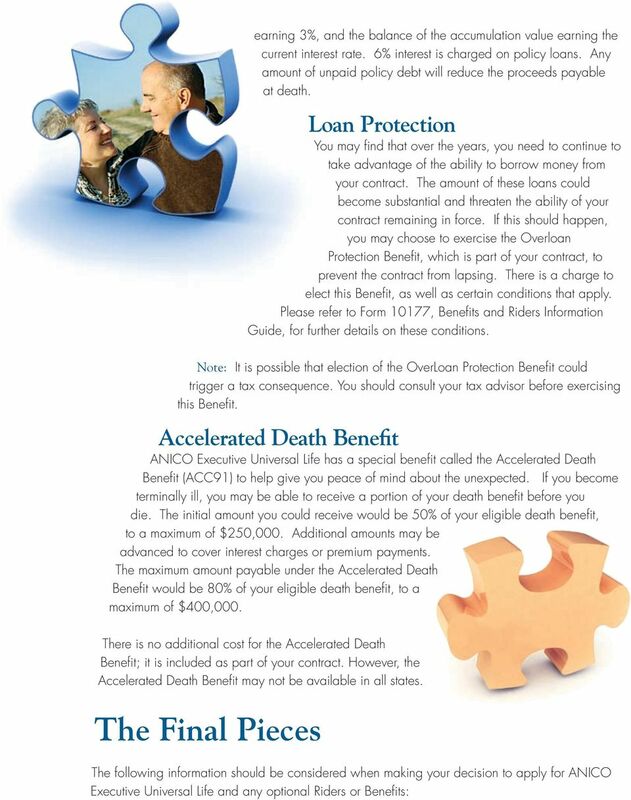 Although we may initially choose a simple financial goal, we often find our financial needs growing -- from protecting existing assets against unforeseen loss, to accumulating a cash reserve for future needs. As our financial plans mature, we may plan to use anticipated cash reserve to enjoy a more secure retirement. We may even seek to leave a financial heritage to future generations, or protect our existing financial heritage from loss. So many diverse goals, and yet these goals, when linked together, form a unique picture of our life. 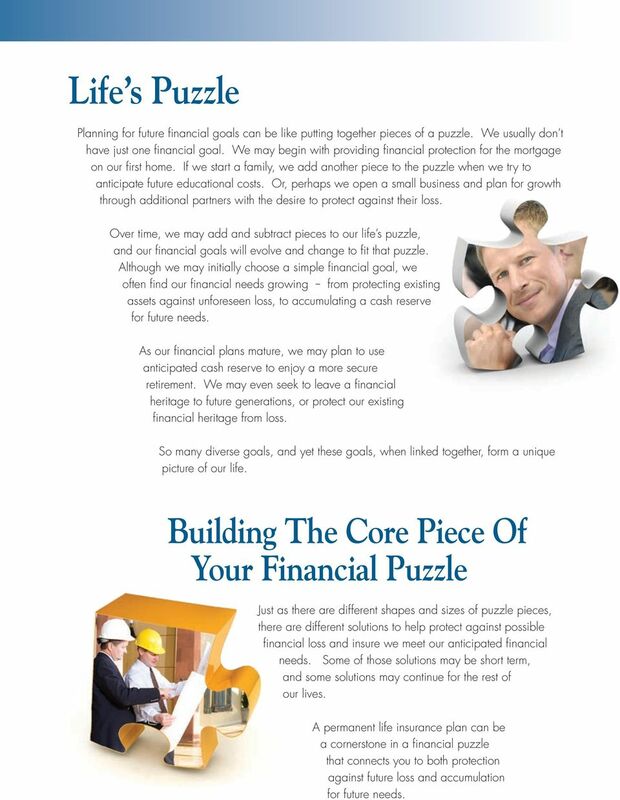 Building The Core Piece Of Your Financial Puzzle Just as there are different shapes and sizes of puzzle pieces, there are different solutions to help protect against possible financial loss and insure we meet our anticipated financial needs. Some of those solutions may be short term, and some solutions may continue for the rest of our lives. 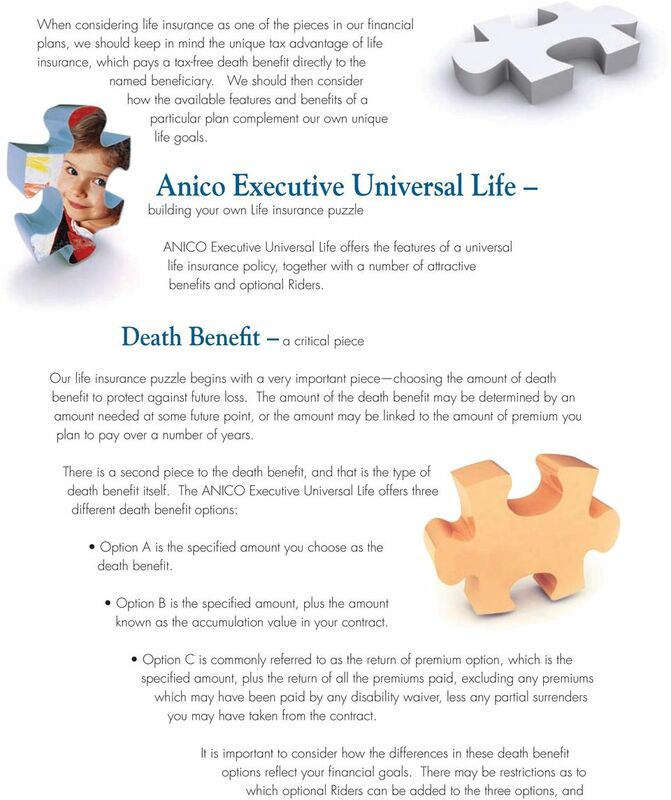 A permanent life insurance plan can be a cornerstone in a financial puzzle that connects you to both protection against future loss and accumulation for future needs. 6 are other contract restrictions that may apply. 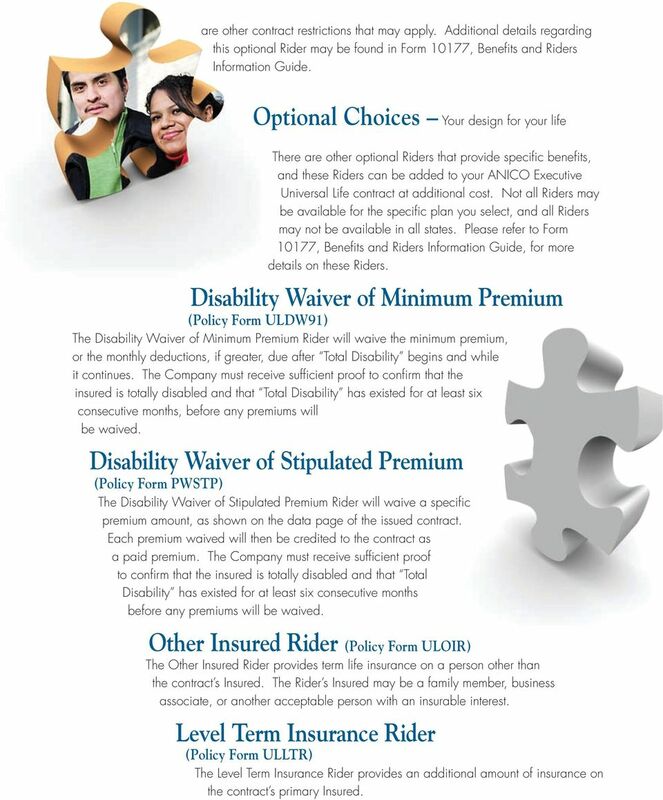 Additional details regarding this optional Rider may be found in Form 10177, Benefits and Riders Information Guide. 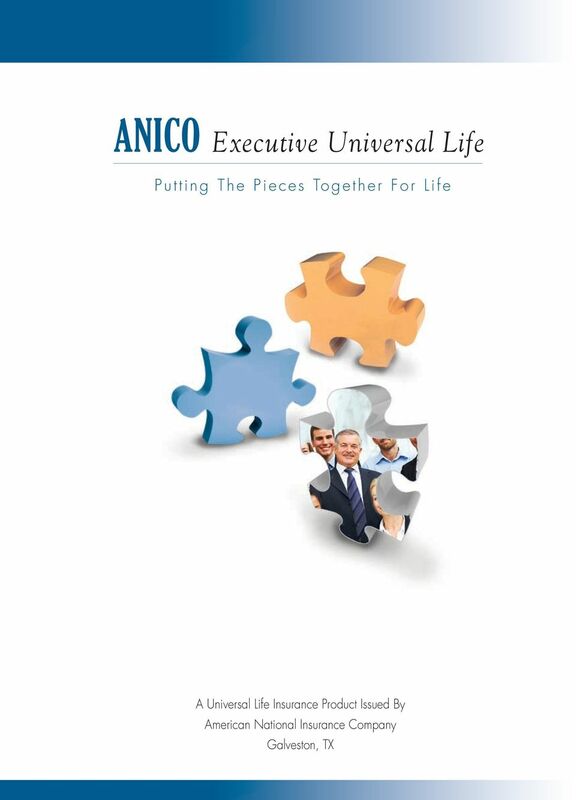 Optional Choices Your design for your life There are other optional Riders that provide specific benefits, and these Riders can be added to your ANICO Executive Universal Life contract at additional cost. Not all Riders may be available for the specific plan you select, and all Riders may not be available in all states. 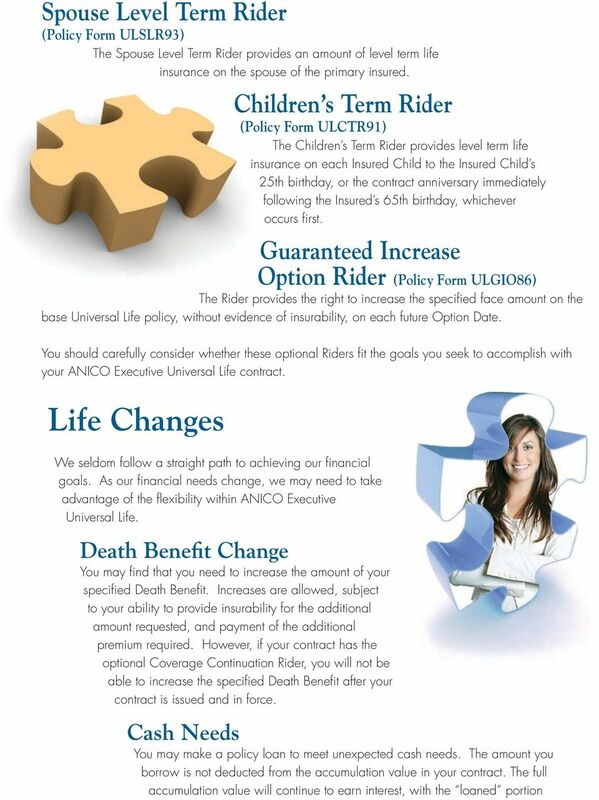 Please refer to Form 10177, Benefits and Riders Information Guide, for more details on these Riders. Disability Waiver of Minimum Premium (Policy Form ULDW91) The Disability Waiver of Minimum Premium Rider will waive the minimum premium, or the monthly deductions, if greater, due after Total Disability begins and while it continues. The Company must receive sufficient proof to confirm that the insured is totally disabled and that Total Disability has existed for at least six consecutive months, before any premiums will be waived. Disability Waiver of Stipulated Premium (Policy Form PWSTP) The Disability Waiver of Stipulated Premium Rider will waive a specific premium amount, as shown on the data page of the issued contract. 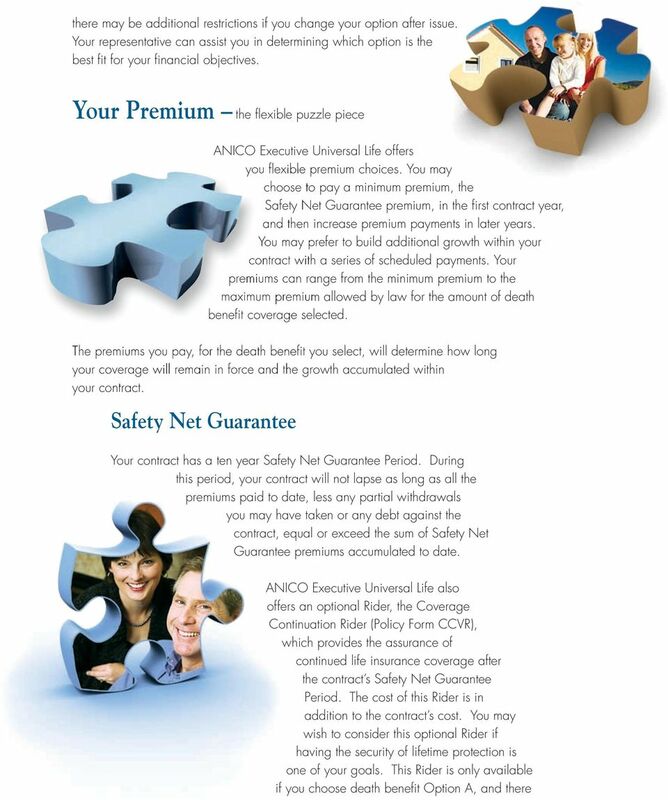 Each premium waived will then be credited to the contract as a paid premium. The Company must receive sufficient proof to confirm that the insured is totally disabled and that Total Disability has existed for at least six consecutive months before any premiums will be waived. Other Insured Rider (Policy Form ULOIR) The Other Insured Rider provides term life insurance on a person other than the contract s Insured. The Rider s Insured may be a family member, business associate, or another acceptable person with an insurable interest. 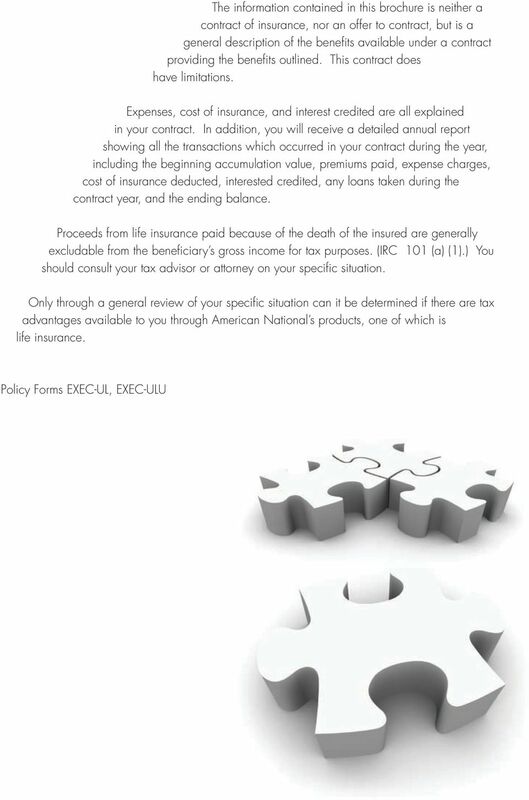 Level Term Insurance Rider (Policy Form ULLTR) The Level Term Insurance Rider provides an additional amount of insurance on the contract s primary Insured. 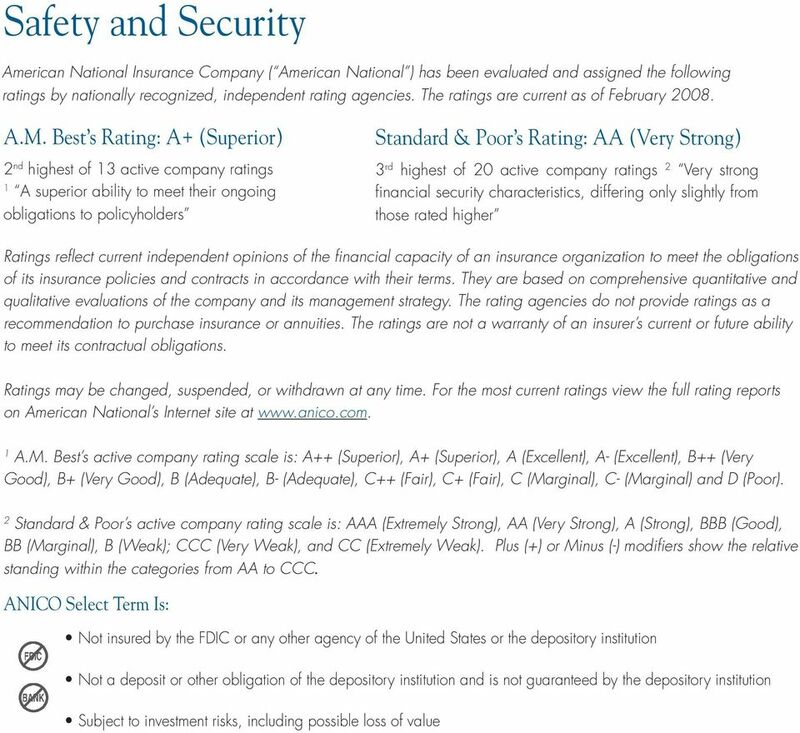 HSBC Life (International) Limited HSBC Life (International) Limited ( the Company ) is incorporated in Bermuda with limited liability, and is one of the HSBC Group s insurance underwriting subsidiaries.